Serial-attached SCSI (SAS) is the evolution of the parallel SCSI interface into a point-to-point interface. SAS cables are a set of four links used as two differential signal pairs. One differential signal transmits in one direction while the other differential signal transmits in the other direction. Data can be transmitted in both directions simultaneously. Each SAS cable contains four SAS physical lanes that are typically organized into a single 4x SAS port. We offer a wide selection of External SAS Cables, External Mini SAS Cables, Internal SAS Cables & Internal Mini SAS Cables, SAS Adapters & Mini SAS Adapters. We can also customize almost any SAS or Mini SAS cable assembly to suit your specific need. External Mini SAS to External Mini SAS cables feature a Universal Keyed Zinc Die Cast SFF-8088 connector on each end. These cables are built using high speed 24 and 28 AWG wire. Applications include InfiniBand, SATA, and Serial Attached SCSI. We offer standard lengths of 0.5 to 10 meters. Custom lengths are available upon request. External Mini SAS to External 4x SAS cables feature a Mini SAS Universal Keyed Zinc Die Cast SFF-8088 connector on one end and a SAS 4x Zinc Die Cast SFF-8470 connector with thumbscrews on the other end. These cables are built using high speed 24 and 28 AWG wire. 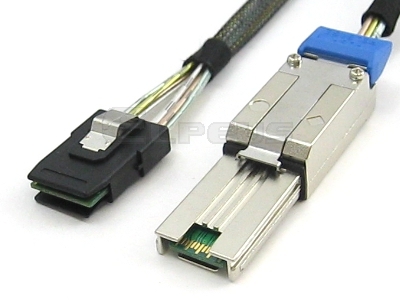 Applications include InfiniBand, SATA, and Serial Attached SCSI. We offer standard lengths of 0.5 to 10 meters. Custom lengths are available upon request. External Mini SAS to 4 eSATA cables feature a Universal Keyed Zinc Die Cast SFF-8088 connector on one end and 4 x eSATA connectors on the other end. These cables are built using high speed 28 AWG wire. 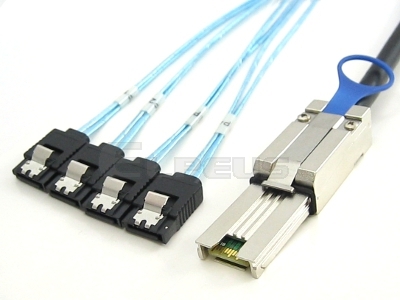 Applications include InfiniBand, SATA, and Serial Attached SCSI. We offer standard lengths of 1 to 3 meters. Custom lengths are available upon request. 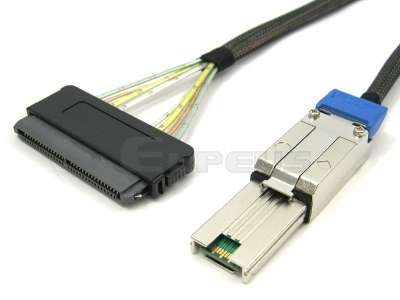 External Mini SAS to 4 SATA cables feature a Universal Keyed Zinc Die Cast SFF-8088 connector on one end and 4 x SATA connectors on the other end. These cables are built using high speed 28 AWG wire. 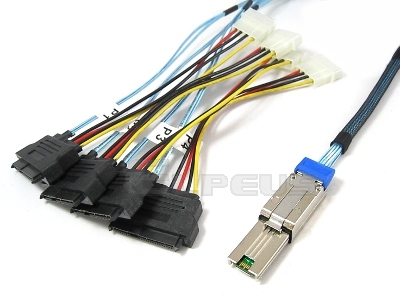 These cables come in 2 versions: SFF-8088 (Host) to 4 SATA (Target) and 4 SATA (Host) to SFF-8088 (Target). The most commonly used is the SFF-8088 to 4 SATA. Applications include SATA, and Serial Attached SCSI. We offer standard lengths of 1 to 3 meters. Custom lengths are available upon request. 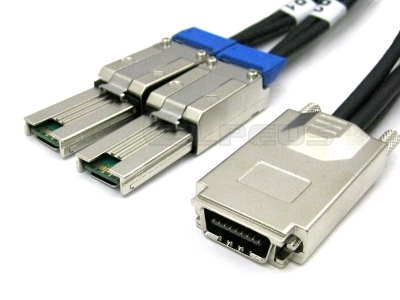 External Mini SAS to 4 29-Pin SAS cables feature a Universal Keyed Zinc Die Cast SFF-8088 connector on one end and 4 SFF-8482 on the other end. These cables are built using high speed 28 AWG wire. Applications include SATA, and Serial Attached SCSI. We offer standard lengths of 1 to 3 meters. Custom lengths are available upon request. 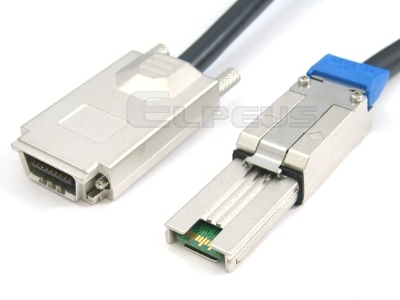 External Mini SAS to Internal Mini SAS cables feature a Universal Keyed Zinc Die Cast SFF-8088 connector on one end and an SFF-8087 connector on the other end. These cables are built using high speed 28 AWG wire. Applications include SATA, and Serial Attached SCSI. We offer standard lengths of 0.5 to 2 meters. Custom lengths are available upon request. External Mini SAS to Internal SAS cables feature a Mini SAS Universal Keyed Zinc Die Cast SFF-8088 connector on one end and a SAS SFF-8484 connector on the other end. These cables are built using high speed 24 and 28 AWG wire. Applications include InfiniBand, SATA, and Serial Attached SCSI. 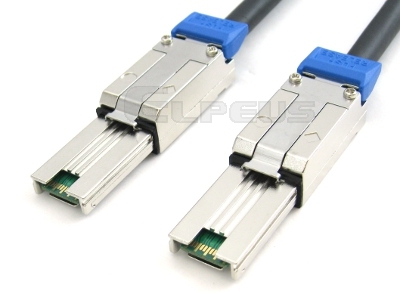 These cables come in 2 versions: SFF-8088 (Host) to SFF-8484 (Target), and SFF-8484(Host) to SFF-8088(Target). We offer standard lengths of 0.5 and 1 meter. Custom lengths are available upon request. 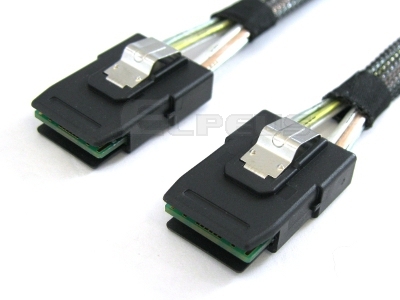 Internal Mini SAS to 4 SATA cables feature an SFF-8088 connector on one end and 4 x SATA connectors on the other end. These cables are built using high speed 28 AWG wire. 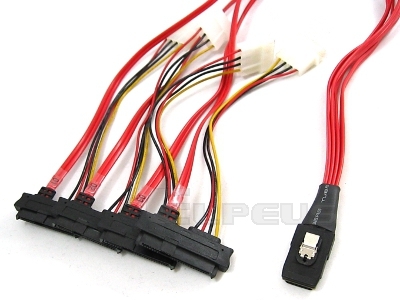 These cables come in 2 versions: SFF-8087 (Host) to 4 SATA (Target) and 4 SATA (Host) to SFF-8087 (Target). 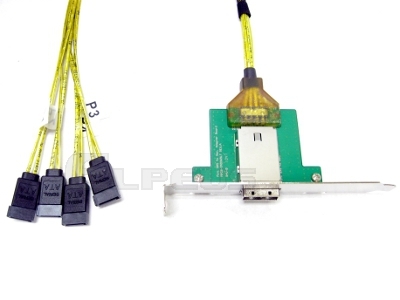 Applications include SATA, and Serial Attached SCSI. We offer standard lengths of 0.5 and 1 meter. Custom lengths are available upon request. Internal Mini SAS to 4 x 29-Pin SAS cables feature an SFF-8088 connector on one end and 4 x SFF-8482 connectors on the other end. These cables are built using high-speed 28 AWG wire. 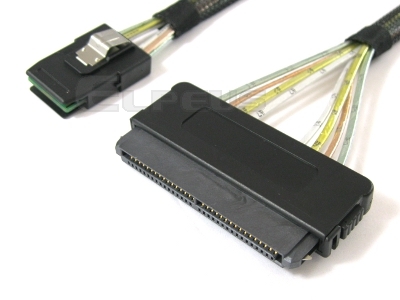 Applications include SATA, and Serial Attached SCSI. We offer standard lengths of 0.5 and 1 meter. Custom lengths are available upon request. Internal Mini SAS to External 4x SAS cables feature a Mini SAS SFF-8087 connector on one end and a SAS 4x Zinc Die Cast SFF-8470 connector with thumbscrews on the other end. These cables are built using high speed 24 and 28 AWG wire. 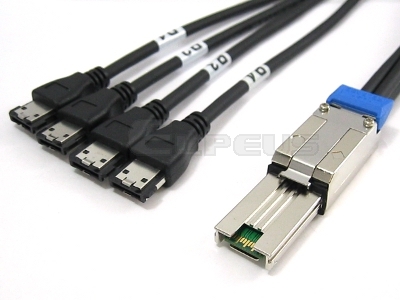 These cables come in 2 versions: SFF-8087 (Host) to SFF-8470 (Target), and SFF-8470 (Host) to SFF-8087 (Target). Applications include InfiniBand, SATA, and Serial Attached SCSI. We offer standard lengths of 0.5 to 3 meters. Custom lengths are available upon request. 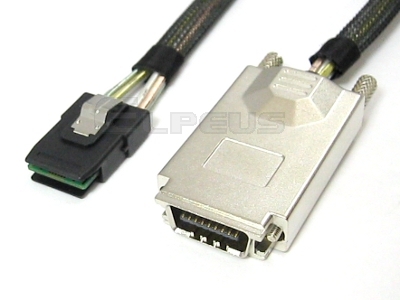 Internal Mini SAS to Internal SAS cables feature a Mini SAS SFF-8087 connector on one end and a SAS SFF-8484 connector on the other end. These cables are built using high speed 24 and 28 AWG wire. Applications include InfiniBand, SATA, and Serial Attached SCSI. 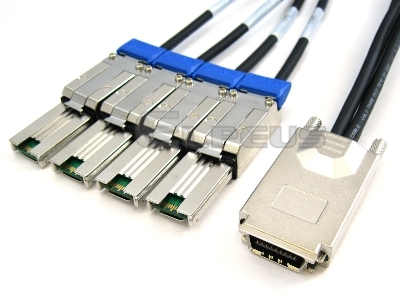 These cables come in 2 versions: SFF-8087 (Host) to SFF-8484 (Target), and SFF-8484(Host) to SFF-8087(Target). We offer standard lengths of 0.5 and 1 meter. Custom lengths are available upon request. 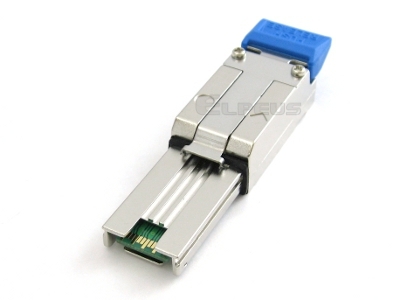 Mini SAS loopback modules are used for testing ports in SAS HBAs and switches. The loopback provides a cost effective method for SAS port testing. It transmits data from the host electrically, to the receiving data outputs and back to the host. External Mini SAS to External Mini SAS cables feature an Active Keyed Zinc Die Cast SFF-8088 connector on each end. 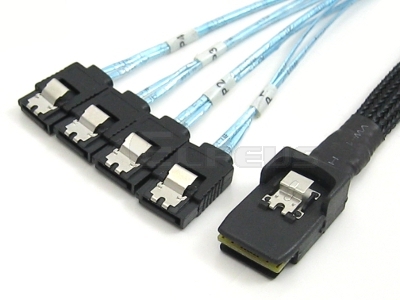 These cables are built using high speed 24, 26, 28 and 30 AWG wire. Applications include InfiniBand, and Serial Attached SCSI 2.1. We offer standard lengths of 5 to 25 meters. Custom lengths are available upon request. External Mini SAS to 4 x External Mini SAS breakout cables feature a Universal Keyed Zinc Die Cast SFF-8088 connector on one end, and 4 x Universal Keyed Zinc Die Cast SFF-8088 connectors on the other end. These cables are built using high speed 24 and 28 AWG wire. 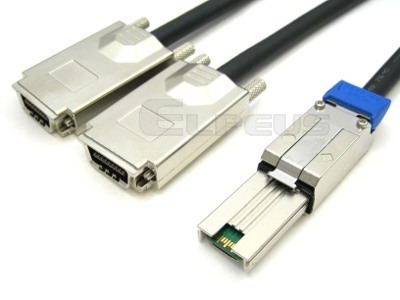 Applications include InfiniBand, SATA, and Serial Attached SCSI. We offer standard lengths of 1 to 5 meters. Custom lengths are available upon request. External Mini SAS to 2 x External Mini SAS Y cables feature a Universal Keyed Zinc Die Cast SFF-8088 connector on one end, and 2 x Universal Keyed Zinc Die Cast SFF-8088 connectors on the other end. These cables are built using high speed 24 and 28 AWG wire. Applications include InfiniBand, SATA, and Serial Attached SCSI. We offer standard lengths of 1 to 5 meters. Custom lengths are available upon request. External SAS to 2 x External Mini SAS breakout cables feature a SAS 4x Zinc Die Cast SFF-8470 connector with thumbscrews on one end, and 2 x Universal Keyed Zinc Die Cast SFF-8088 connectors on the other end. These cables are built using high speed 24 and 28 AWG wire. 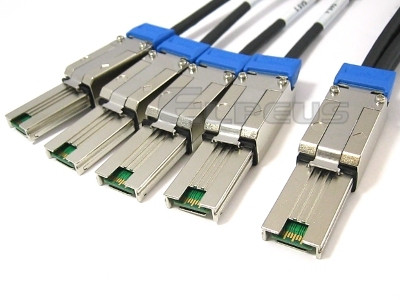 Applications include InfiniBand, SATA, and Serial Attached SCSI. We offer standard lengths of 1 to 3 meters. Custom lengths are available upon request. External SAS to 4 x External Mini SAS breakout cables feature a SAS 4x Zinc Die Cast SFF-8470 connector with thumbscrews on one end, and 4 x Universal Keyed Zinc Die Cast SFF-8088 connectors on the other end. These cables are built using high-speed 24 and 28 AWG wire. Applications include InfiniBand, SATA, and Serial Attached SCSI. We offer standard lengths of 1 to 3 meters. Custom lengths are available upon request. External Mini SAS to 2 x External SAS Y cables feature a Universal Keyed Zinc Die Cast SFF-8088 connector on one end, and 2 x SAS 4x Zinc Die Cast SFF-8470 connector with thumbscrews on the other end. These cables are built using high speed 24 and 28 AWG wire. 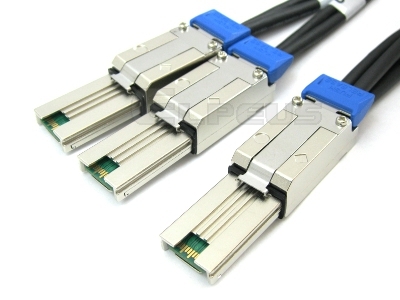 Applications include InfiniBand, SATA, and Serial Attached SCSI. We offer standard lengths of 1 to 3 meters. Custom lengths are available upon request.